Australian scientists have discovered a new group of genes that could be responsible for causing heart defects in children, which affect more than 2000 babies born each year in Australia. Researchers at Sydney's Victor Chang Cardiac Research Institute, have found that as well as genes that are active in the heart as it forms, genes not directly involved in the development of the heart may also cause a congenital heart defect. Their findings are reported this month in the prestigious international journal, Human Molecular Genetics. It is estimated up to 20 per cent of heart defects are linked to gene abnormalities, but for the remaining 80 per cent, the cause is largely unknown[i]. "Up until now, scientists around the world have identified gene abnormalities, or mutations, in a number of cases of congenital heart disease (CHD), by looking at those genes that are active in the heart as it's developing - the logical place one would search," said Associate Professor Sally Dunwoodie, Head of the Embryology Laboratory at the Victor Chang Cardiac Research Institute in Sydney. "What our research shows, is that we now must widen that search, to include genes that are active outside the heart as it forms, elsewhere in the embryo, because they may also impact on the heart's formation," continued Associate Professor Dunwoodie. Using a mouse model, the researchers reveal that a gene called Cited2 is active in the heart during development, but its activity there plays no role in normal heart formation. Rather, it is its earlier activity in embryonic tissue, before the primitive heart develops, that can affect the subsequent formation of the heart and result in defects at birth. In Australia, heart disease is the leading cause of childhood death, accounting for 30 per cent of deaths in children under five. Heart disease in children can range from a relatively simple hole in the heart, to a highly complex range of conditions that can either cause the developing baby to die in the womb, or can severely affect the heart's rhythm and blood flow. Associate Professor Dunwoodie says this research could help identify a far greater range of causes for CHD, underpinning better treatment for patients and improving genetic counselling for families. "Cures for heart disease in children are rare. 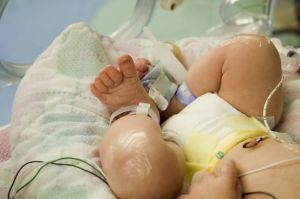 A number of surgical techniques are available to improve quality of life for kids with heart disease, but in many cases this involves massive and repeated surgery on tiny babies. So early intervention and genetic testing to see if family members are likely to have a baby with a heart defect, are where the real differences are going to be made." There are currently up to 32,000 adult survivors in Australia who were born with CHD, with their offspring having a much greater risk of developing heart disease at birth. The number of adult survivors of childhood heart disease is increasing steadily at a rate of 5 per cent per year. "The need for greater knowledge into what causes, and ideally what can treat and cure childhood heart disease, has never been greater," concluded Associate Professor Dunwoodie.